~Payout depends on the severity of the condition. Please refer the sales brochure carefully for the payouts at different level of conditions. `The Sum Assured chosen at inception increases by 10% simple interest on each policy anniversary, for every claim free year. The maximum Sum Assured under the cover will be capped at 200% of the Sum Assured chosen at inception. This increase in Sum Assured will stop on occurrence of first claim under the cover. Where Cancer cover and Heart cover are chosen together, the Sums Assured for both the covers increase by 10% simple interest on each policy anniversary, for every claim free year. The maximum sum assured will be capped at 200% of the Sum Assured chosen at inception for each type of cover. In case of occurrence of first claim under any one type of cover, the increase in Sum Assured will stop for that cover type and Increasing Cover Benefit will continue for the other type of cover, for which no claim has occurred. 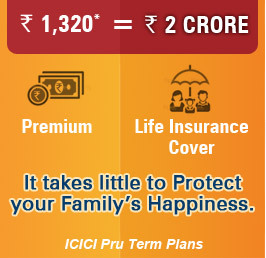 @A discount of 5% on the first year’s premium will be offered on purchase of ICICI Pru Heart / Cancer Protect when life assured and his/ her spouse is covered under the same policy. The policy benefits of both the Lives Assured shall be independent of each other. The Sums Assured of both the lives could be different. A claim made by one Life Assured under the policy does not affect benefits of other Life Assured. This Family benefit has to be chosen at the inception of the policy only, spouse cannot be added once the policy is issued. This discount is not applicable on Single Pay Policy. With one policy, you can avail either Family Benefit or Loyalty Benefit. #The Accelerated Critical Illness (ACI) benefit is an accelerated benefit and the death benefit will be reduced by the critical illness cover paid to the policyholder. ACI benefit is available only with Life & Health and All-in-One option. To know more about the illnesses covered, please refer to the sales brochure. 33Tax benefits are subject to conditions of section 80C, 80CCC, 80D, 10(10D) and 10(10A) of the Income Tax Act, 1961 and are subject to amendments made thereto from time to time. Service Tax and Swach Bharat cess and other applicable cesses will be charged extra as per applicable rates. 2The non-medical limit depends on age(upto 50 yrs) & health status. 4Premiums paid under policy are eligible for tax benefit under Section 80CCC and commutation is tax free under section 10(10A) of the Income Tax Act, 1961. On commutation you can receive up to one third of the accumulated value. 6Additional premium will be calculated based on the increased Sum Assured and outstanding policy term as per your age at the time of each such increase. 13Guaranteed cash benefit will be equal to 1 % of the Guaranteed Maturity Benefit (GMB). This is a regular payout which you will receive each month of the 10 year period, starting from the beginning of the payout phase. You can also chose to receive this payout every year instead of every month. In this case your regular payout will be 11.5% of GMB. 15Guaranteed Additions (GAs) equal to 5% of GMB each year will accrue during the first five policy years if all due premiums are paid. Guaranteed benefits are available only if all premiums are paid as per the premium payment term and the policy is inforce till the completion of entire policy term. Important points for Unit Linked Insurance Plans : On surrender after completion of five years, the surrender value will be the Fund Value including Top up Fund Value, if any. Unit linked Insurance products do not offer any liquidity during the first five years of the contract. The Policyholder will not be able to surrender/withdraw the monies invested in unit linked insurance products completely or partially till the end of the fifth year. Unlike traditional products, unit linked insurance products are subject to market risk, which affect the Net Asset Values and the customer shall be responsible for his/her decision. The names of the Company, product names or fund options do not indicate their quality or future guidance on returns. Funds do not offer guaranteed or assured returns. On cancellation of the policy during the free look period, we will return the premium paid subject to the deductions as mentioned in the terms and conditions of the respective product brochures. The policy shall terminate on payment of this amount and all rights, benefits and interests under this policy will stand extinguished. The contents herein above shall not be considered as an invitation or persuasion to trade or invest. Investors should make an independent judgment with regards to the suitability, profitability and fitness of any service offered herein above ICICI Securities Limited (I-Sec) and affiliates accept no liabilities for any loss or damage of any kind arising out of any actions taken in reliance there on. The information contained herein is strictly confidential and meant for solely selected recipient and may not be altered in anyway, transmitted, to copied or distributed in part or in whole to any other person or to media or reproduced in any other form or format without prior written consent of I-Sec. The contents of this mail are solely for informational purpose & may not be used or considered as an offer document or solicitation of offer to buy or sell or subscribe for securities or other financial instruments or any other product. While due care has been taken in preparing this mail. I-Sec and affiliates accept no liabilities for any loss or damage of any kind arising out of any inaccurate, delayed or incomplete information not for any actions taken in reliance there on. This mail is not directed or intended for distribution to use by, any person or entity who is a citizen or resident of or any located in locality, state country or other jurisdiction where such distribution, publication, availability or use would be contrary to law regulation or which would subject I-Sec and affiliates to any registration or licensing requirement within such jurisdiction. Solicitation through any means of communication other than in person. 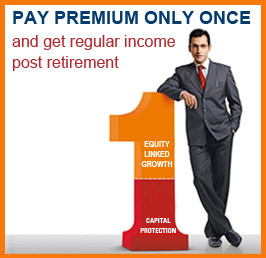 ICICI Prudential Retirement Income Solution III (1) ICICI Pru Cash Advantage, and (2) ICICI Pru Immediate Annuity. 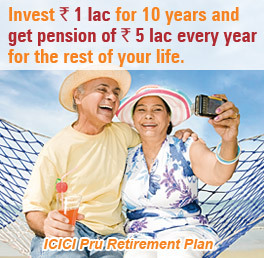 ICICI Prudential Retirement Income Solution IV (1) ICICI Pru Saving Suraksha, and (2) ICIC Pru Immediate Annuity. ICICI Securities Limited with its registered office at ICICI Centre, H.T. Parekh Marg, Churchgate, Mumbai 400020 is a corporate agent (COR No: CA0113) of ICICI Prudential Life Insurance Company Limited ("ICICI Prulife").Insurance is underwritten by ICICI Prulife. ICICI Securities Limited customers' participation in the policy is entirely voluntary. The contract of insurance is with ICICI Prudential Life Insurance Company Limited, who is liable for all valid claims on the policy. ICICI Securities Ltd customers participation in the policy is entirely voluntary. ICICI Prudential Life Insurance Company. IRDAI Regn No. 105. CIN:U66010MH2000PLC127837. © 2015, ICICI Prudential Life Insurance Co. Ltd Registered Address: - ICICI Pru Life Towers, 1089 Appasaheb Marathe Marg, Prabhadevi, Mumbai-400025. Insurance is the subject matter of the solicitation. For more details on the risk factors, term & conditions please read sales brochure carefully before concluding the sale. Call us on 1-860-266-7766 (10am-7pm, Monday to Saturday, except national holidays. Valid only for calls made from India). Pursuant to the Power of Attorney issued by the Customer in favour of ICICI Securities Limited, ICICI Securities Limited shall have the authority to sign all the documents / proposal forms on behalf of the Customer and submit the same to the Insurance Company pursuant to the online instructions submitted by the Customer. Disclaimer : The above listed insurance products are available online with ICICI Securities Ltd. For details on the complete list of all insurance products please get in touch with your Relationship Manager. ICICI Securities Ltd., Corporate Agent of ICICI Prudential & ICICI Lombard, Composite Corporate Agent License No. CA0113. Registered office of I-Sec is at ICICI Securities Ltd. - ICICI Centre, H. T. Parekh Marg, Churchgate, Mumbai - 400020, India. Insurance is the subject matter of solicitation. ICICI Securities does not underwrite the risk or act as an insurer. Nothing contained on the Website shall constitute or be deemed to constitute an advice, an offer to purchase or an invitation or solicitation to undertake any activity or enter into any transaction relating to the Insurance Products. General Insurance products cover Health, Home, Motor and Travel, and help protect your financial health unforeseen events strike close to home. ICICI Lombard is the leading private general insurance company and has one of the best products. Our partnership with ICICI Lombard enables us to bring to you the entire range of insurance offerings for your personal and professional needs, with minimal paperwork and at the comfort of your home or office. Select products can be entirely bought online on ICICIdirect.com with instant policy issuance. Health Insurance (popularly known as Mediclaim) offers protection in case of unexpected medical emergencies. In case of a sudden illness or accident, the health insurance policy takes care of the hospitalization, medical and other cost incurred. You can avail of tax benefits for below mentioned products except Personal accident as per provisions of Section 80D of the Income Tax (Amendment) Act,1961. ICICI Lombard Complete Health Insurance is a comprehensive plan designed to protect you and your family against expenses incurred in case of hospitalization. This health insurance policy can be customized to suit your requirements and budget. Secure yourself from surging medical costs and unexpected health issues with the Health Booster Policy. The Health Booster Policy is a super top-up plan that extends your coverage for illnesses and expenses not covered by your base plan or top-ups, it also comes with a deductible threshold. A cover that restores faith in the future. ICICI Lombard Personal Accident Insurance policy covers you not only against Accidental Death and Permanent Total Disablement (PTD), but also against acts of terrorism. A comprehensive package for your two-wheelers and four-wheelers, securing them against damage caused by natural and man-made calamities. A comprehensive policy for your four-wheeler; securing it against damage caused by natural and man-made calamities. A Comprehensive package policy for your two wheeler, securing them against damage caused by natural and man-made calamities. International travel covers unexpected and emergency medical expenses incurred when a person is in overseas. In addition to the medical cover, there are non-medical covers like baggage loss / delay, trip cancellation / interruption / delay, passport loss, personal accident cover and financial emergency. Planning to visit abroad for a vacation or for business meetings? Worried about ill-health and non-medical emergencies? Just choose Single round trip travel insurance of ICICI Lombard and travel worry-free. Home Insurance Our Home Insurance policy secures the structure as well as the contents of your home against natural and man-made disasters. Secure your most prized possession against terrorist activities by opting for a Terrorism Cover. Protect your home with the comprehensive coverage. Get protection for structure and/or contents of your home. Avail 50% discount on buying a 10 years policy. Registered office of I-Sec is at ICICI Securities Ltd. - ICICI Centre, H. T. Parekh Marg, Churchgate, Mumbai - 400020, India. Insurance is the subject matter of solicitation. ICICI Securities does not underwrite the risk or act as an insurer. Nothing contained on the Website shall constitute or be deemed to constitute an advice, an offer to purchase or an invitation or solicitation to undertake any activity or enter into any transaction relating to the Insurance Products. On surrender after completion of five years, the surrender value will be the Fund Value including Top up Fund Value, if any. Unit linked Insurance products do not offer any liquidity during the first five years of the contract. The Policyholder will not be able to surrender/withdraw the monies invested in unit linked insurance products completely or partially till the end of the fifth year. Tax benefits under the policy are subject to conditions under Sec.10 (10D) and Sec. 80C of the Income Tax Act, 1961. Service Tax and Cess will be charged extra as per applicable rates. Tax laws are subject to amendments from time to time. © 2014, ICICI Prudential Life Insurance Co. Ltd. IRDA Reg No: 105. CIN: L66010MH2000PLC127837. Registered Address: ICICI Prulife Towers, 1089, Appasaheb Marathe Marg, Prabhadevi, Mumbai 400025. Insurance is the subject matter of the solicitation. 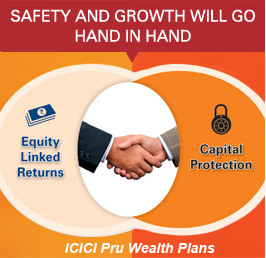 For more details on risk factors, terms and conditions, please read the sales brochure carefully before concluding a sale.To know the contact details, log on to www.iciciprulife.com. Call us on 1-860-266-7766 (9am-9pm, Monday to Saturday, except national holidays. Valid only for calls made from India. IRDA or its officials do not involve in activities like sale of any kind of insurance or financial products nor invest premiums. IRDA does not announce any bonus. Public receiving such phone calls are requested to lodge a police complaint along with details of phone call, number.